How good are hedge funds at stock picking? Trading Nation: Bad ISM, so what? 2015 is turning out to be one of the worst years on record for hedge funds. But for those losing faith in their stock-picking capabilities, one research paper provides a comforting conclusion — hedge funds may not be so bad at it after all. According to the Hedge Fund Research HFRI Fund Weighted Composite Index, hedge funds have seen returns this year through October of about 0.03 percent. This puts 2015 on track for the fourth-worst year of returns for hedge funds, after 2002, 2011 and 2008. But Jonathan Rhinesmith, doctoral candidate in economics at Harvard University, said the biggest buys for hedge funds have a tendency to go up, and stay up. "My research has found that at least historically, hedge funds have actually done pretty well, especially when you make that comparison to a monkey throwing darts," Rhinesmith said, referring to the trope implying that a portfolio of stocks chosen by a monkey randomly throwing darts at a paper would outperform a fund manager's personal picks. Rhinesmith's paper, "Conviction and volume: Measuring the information content of hedge fund trading," analyzes $4.3 trillion in purchases of equity positions. Based on filings with the Securities and Exchange Commission, he found that the stocks that hedge funds took the biggest positions in tend to increase in price the most, and maintain higher prices even as firms exit large trades. Since these stock picks outperform overall in the longer term, gains from hedge funds positions shouldn't be solely attributable to temporary price pressure due to the large trade itself, Rhinesmith said. "Hedge funds do in fact predict future stock returns when they take up a lot of volume in stocks. And not only that, but the the returns that they predict don't revert," he said in an interview with CNBC's "Trading Nation." "By that measure, hedge funds are actually pretty informed. Furthermore, they even predict earnings returns in stocks." In another paper, Rhinesmith takes a look at "doubling down," in which fund managers take another large stake in an existing position even after the stock has underperformed. He found that the greater the losses before doubling down, the more that position tended to outperform. This could indicate that when a hedge fund has a great deal of conviction on a stock, that stock will actually tend to do well, which is more evidence that hedge funds hold relevant information of a stock's value. Despite that relevant knowledge, this rarely happens, Rhinesmith writes, because investment managers are reluctant to add to losing positions and risk their careers. 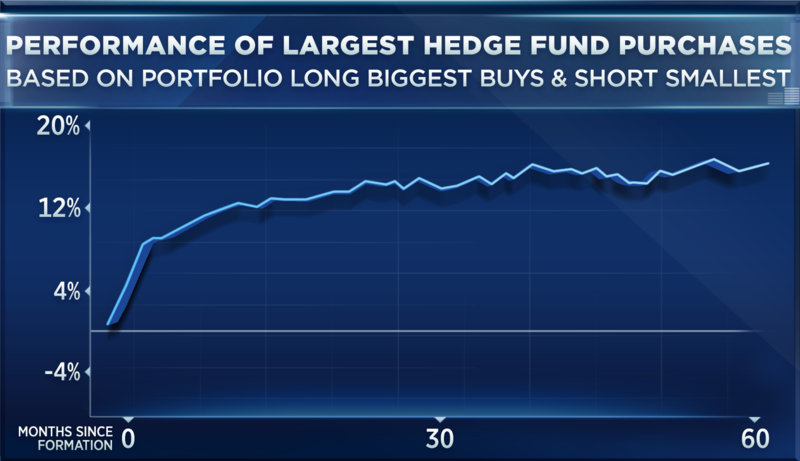 Unfortunately for other investors, those looking to follow in a hedge fund's footsteps may not find much outperformance. According to Rhinesmith, trades executed based on filings that list a fund's holdings will likely be late to the game. "By the time these filings are made publicly available, hedge funds have actually already moved prices so much that there's not as much juice in the trade," he said. The bright side, however, is that this implies that hedge fund purchases bring share prices closer to their "fundamental value," meaning that hedge funds end up improving the pricing of stocks bought and sold by less-informed investors.